SPRING HAS SPRUNG!! ( Well, sort of….) | Vermont Paddle Pups! So after a winter marked by 36 days with temperatures below zero, and many days of dangerous wind chill levels…..does this magical equinox mean all is fair? Not in Vermont, where spring snows, cold, and storms are not uncommon. This has not been a record breaking winter, just the coldest since 2007 ( 41 days with below zero temps!). On Memorial Day weekend 2013, we had snow, so maybe we still have some strange weather in the offing! 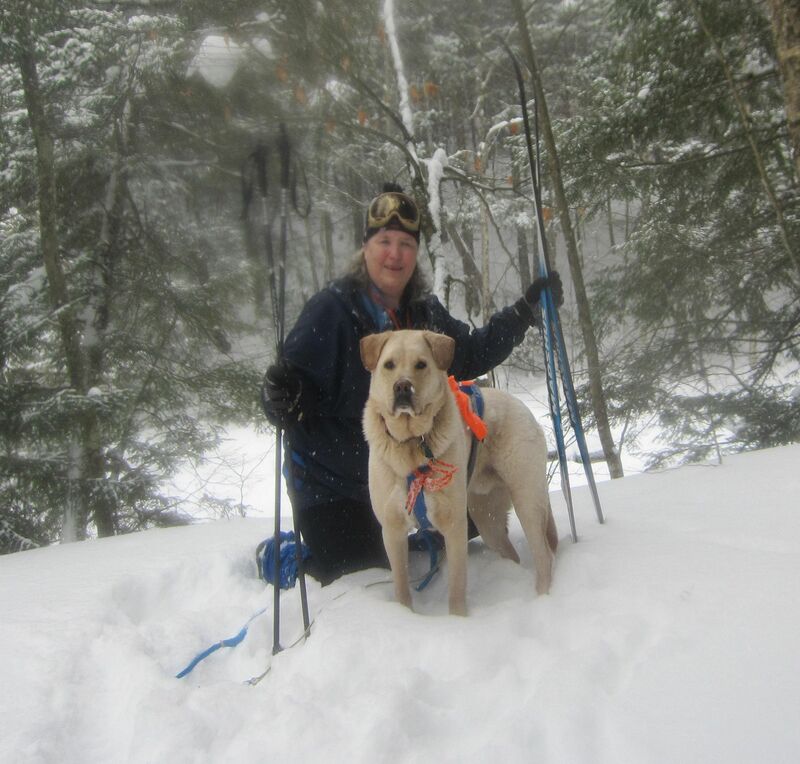 A sloggy snowshoe, in 47 degree temps, just before the rain arrived…. 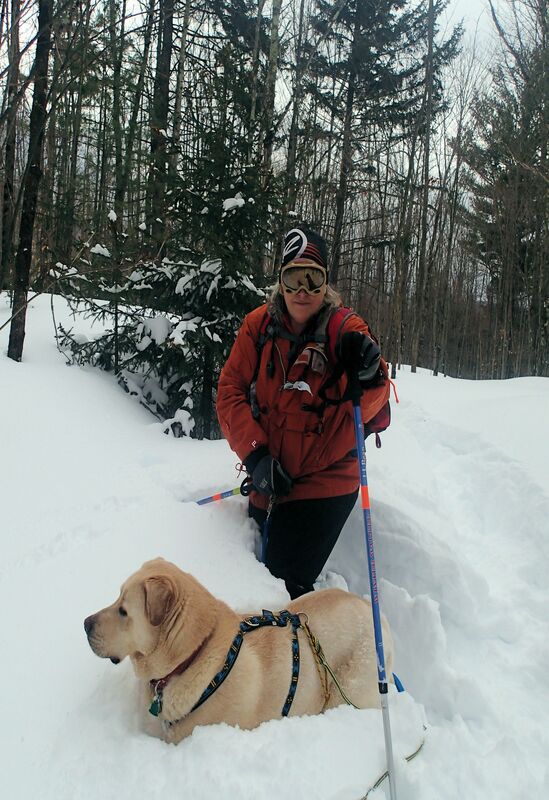 The March 13 storm dumped 2 feet of snow, making for fun playing, and challenging snowshoeing. Thoughts of green grass, fresh,warm breezes, and cool summer nights are invading our thoughts. The snow was so heavy and deep, it collapsed the old sugarhouse on this trail network. Edgar hoots at the snow..he loves it! 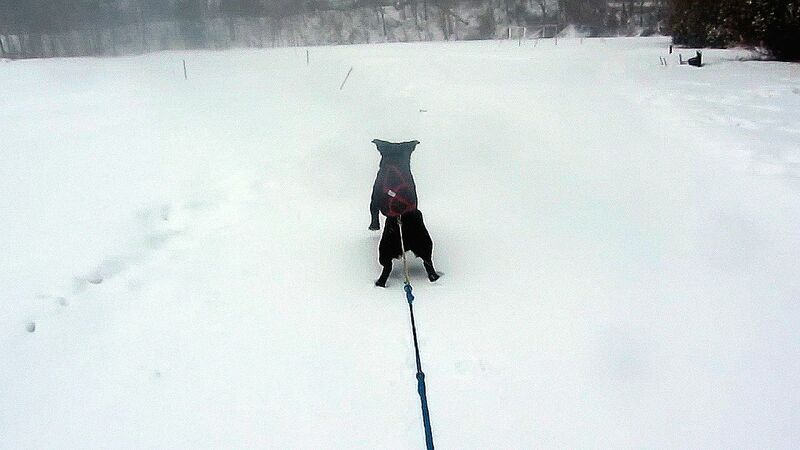 The dogs were able to both get out skijoring…in the sun and in one of our snowstorms. Edgar really into the pulling! We head off to a PaddleSports show in a few weeks…the sight of canoes and kayaks in water (even if it is a pool!) will certainly be welcome! 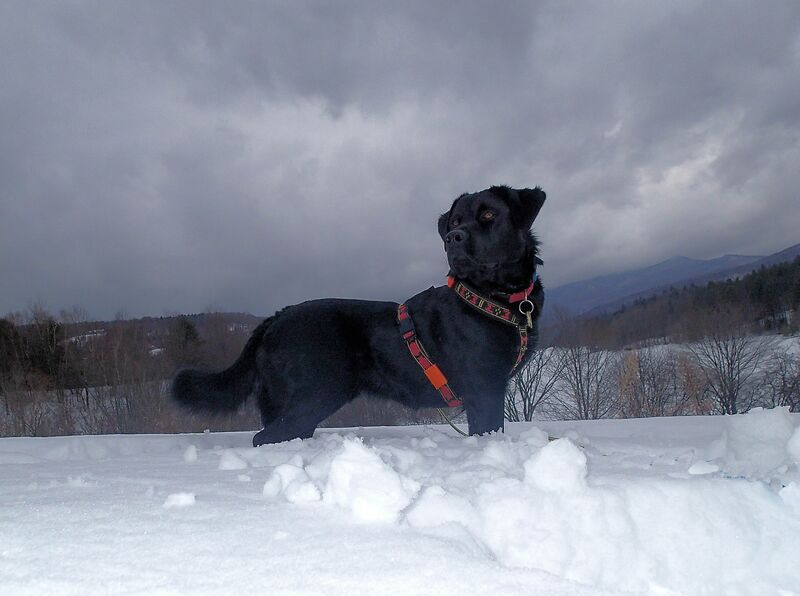 In 2014, spring began with the vernal equinox on March 20 at 12:57 P.M. Edgar greeted the new season with a regal stance, overlooking the water where we’ll be paddling in less than two months! ← Reconnaissance in Rangeley ! 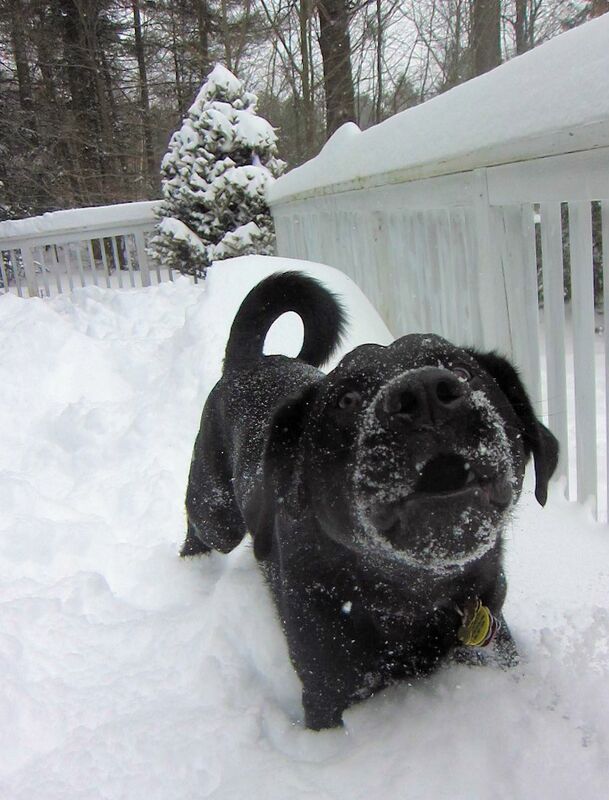 Oh my, you all got a lot of snow. 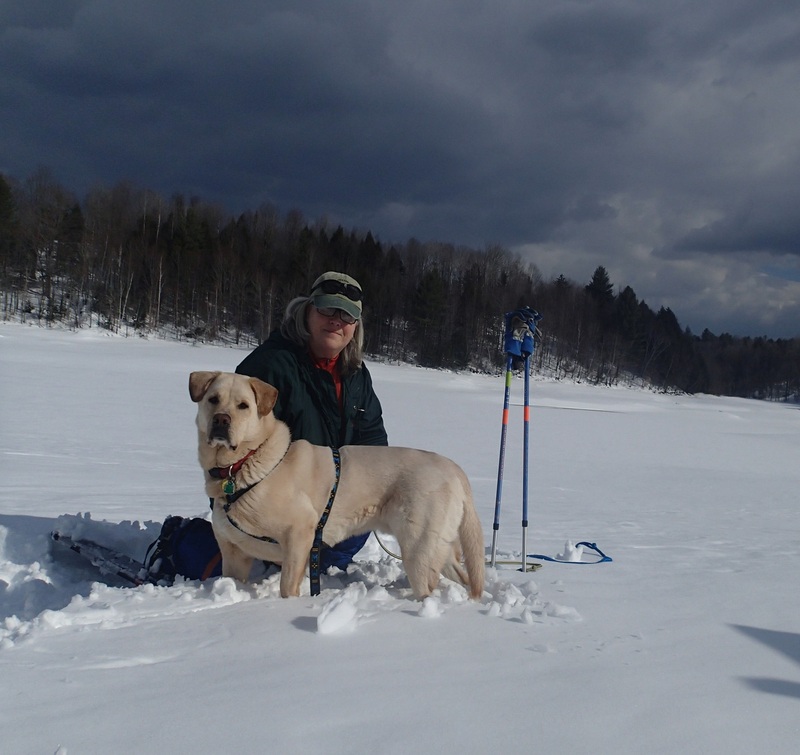 I bet you are looking forward to the Spring thaw so you can get in some paddling. Thanks for visiting my blog today…it is so nice to meet new friends! I have added you to my reading list! Thanks Oz! We love terriers… we had a JRT in the past, who hated going in boats, would walk on the back of our snowshoes, did not like snow…but he was the most amusing, clever, friendly ( not to mention quite portable) dog we’ve had!